I must say it has been a pretty amazing start to the season this year. Upsets everywhere and some great close footy to go with it. But one of the more extraordinary things is that we have seen is that most coaches have nailed the majority of the rookies. This is a pretty rare thing. But that doesn’t mean this game is getting any easier, we just got lucky! But with most making their first trades in RDT and SC this is the week to Scramble! 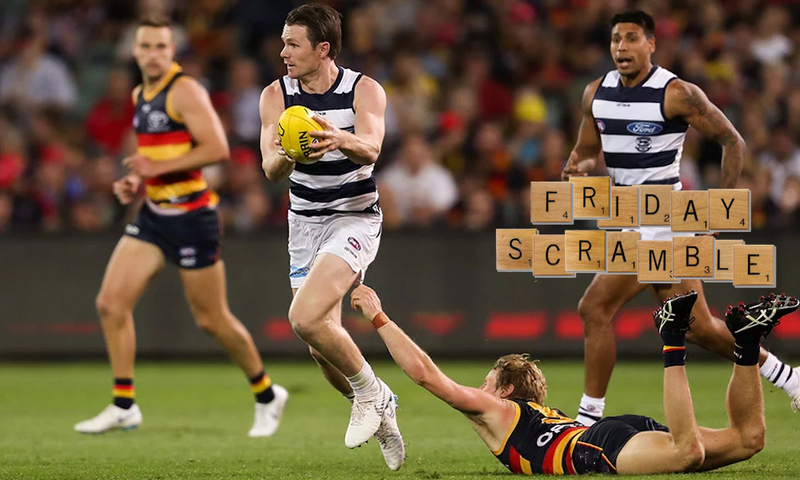 Our early season Thursday night games continue on and last night we saw the Cats and Crows go at it in Adelaide. There were plenty of Loophole relevant players in this one so I am sure that all of you had a chance to deploy the VC. The question is how well did you do? Did you pick someone worthy of keeping as your VC? Danger – 132 Yup, lock that one in. Brad Crouch – 128. Lock this one in as well. Sloane – 120. On the money. Choices to make. If you don’t have one of the top couple from Calvin probably take it. Matt Crouch – 101. No, not enough for us. (For those early readers I put 119 here, sorry about that, that was his SC score). Kelly – 93. Could have been bigger but missed the end of the game with a knee. Nope. Laird – 84. Nope, not an option for us to take. As Calvin mentioned in his Wednesday article our line sits at about 120 so based on that we can safely take Danger and B Crouch, but Sloane and M Crouch are a risky proposition. Other than those three there wasn’t anyone else that we should be taking from the game with our VC. In the two limited trade forms of the game the trade window is now open. We try and hold off and not trade in the first couple of weeks as we conserve trades. But now that prices are about to change in those games you should be looking at making the all important correction trades. In AF of course we have our two trades each week to use up so think about how you want to use them this week. Now correction trades don’t always mean rookies. It can mean any of your players, premiums included. Our first priority is to always fix up any rookies that you have missed. I am not going to rattle through all of the rookies that are must haves. Fry has done an awesome job of that already, so check out his article and make sure that you have all of the key rookies that he mentions. However, if you are looking to trade out a premium make sure you are smart about it. Don’t just look at your lowest scoring premium. Look at why they have been scoring poorly. Is it matchups? Has their team had a tough run? Is a key person that normally gets the attention out? Similarly don’t just jump on the highest averaging players. Check out why they have been averaging well. Have they had soft matchups to start the year? Have they had a role change? The main factors that you would take into account when looking at premium trades is to look at the guys that have had role changes either for the better or for worse. If we take a couple of examples that might help. Callum Mills is a player that many thought would get more midfield time, but he actually spent 100% of the game on Friday night in defence for the Swans against Adelaide. This is not what we want and not what many of his owners would have expected when they selected him. So there is a valid reason to trade him out (yes I know he isn’t a super premium). On the other side of the coin we can look at someone like Marcus Bontempelli who has been spending a lot more time in the midfield than he did last year, this role change has been a good one for him. Similarly we can look at Rocky who is spending more time in the midfield and has had a role change that has released him and we know he is injury free now which also contributes as a good reason to get him. Overall just make sure that you are improving your team and not just trading someone for the sake of it. For me what I will be doing with all of my trades is playing the break even game. That is where you look at the Break Even for your players, see whose is high and either close to or above their average of the players that are ones that you plan to eventually trade out and then use them as your players to downgrade/upgrade. The first question I received this week and it is a great one. The answer isn’t as clear cut as you would like though. To me there is no particular round that you stop shuffling under performing premiums and start upgrading. This is highly dependent on what is happening within your squad. The way that I look at trading is, as I mentioned above, to play the break even game. I will look at when my rookies are fat and ready to cull by using their average and break even. When any of these guys reach that point their trade is prioritised. If there are none of these guys in that position then next I will look to see if there is any rookie that I have missed out on that has a massively negative break even. In that case I will cull the fattest rookie to get this new one in. If there is nothing to do in either of these two circumstances then I will look at shuffling premos and midpricers. So I guess in a long winded way that is the approach I take and recommend. As for when this will happen? Who knows, but given the crop of rookies we have I suspect it is probably another couple of weeks away yet before we will start doing mass upgrades and downgrades. Could this week be a trade rookies week? Even if you don’t have too. Just to make some coin? Otherwise do you even trade if you think you have the best rookies already? Dale’s tweet came in just after AJS Hawker and is along the same lines. I wanted to highlight this one as your comment “Just to make some coin” stood out to me. Making money from our rookies is the name of the game so we should look to do that. But I want to put a big caveat on this, if you have one of the rookies that are considered to be the best don’t just trade them now because you have nothing else to do. The only time you would trade one of these guys out is if the next rookie that you bring in has the ability to make more cash than the one you have traded out early. They need to make the total plus the amount you sacrificed to get them in. Do we even trade if we have the best rookies? Yes, I am sure there is a mid pricer or premium that is not performing and has a high BE that you can fix up and then trade them in later cheaper. But just be careful. You can’t always get that premium back in straight away if carnage his next week. So be prepared to keep the new guy if this happens. Hi Jack. Sorry to see you got on the Jacobs train this year, I was on that one last season and it was a massive disappointment when the train finally reach its destination! (did it even get started?). Sorry I digress, Yes. Yes and Yes. Jacobs to Grundy is the right move (Obviously Adelaide played last night but I hope you made the move). Unless you think Witts will average more than Grundy from here to the end of the season you pick Grundy. Just think how you will feel when he is peeling off 130’s and Witts is delivering 100’s. This is 30 points behind the rest of the comp that you will have each week. Even though the Crows played last night I left this question in because for me even if soaks up all your cash, a move from a Jacobs/Goldy type to Grundy is going to be the right move when we look back at it at year’s end. Don’t be afraid to make these bold moves, it is moves like this that make your season (or can break it but you gotta risk it to win it all!). Sacrifice a mid pricer (sheed, Libba or cousins) to get goldy to Grundy? Hi Josh, I would be careful in sacrificing these guys at the moment as they are going to generate a lot of cash. Having said that moving Goldy out to get in Grundy is a great move. For me here the question is who are you going to downgrade those guys too. I am assuming you have all the top rookies and if that is the case it is a harder decision to make. Goldy faces Big Boy this week who will work him over around the ground so if you are going Cousins to Constable I can understand it but this is a close call for mine. Struggling to use my 2 trades this week. Is it worth trading out setterfield to jump on Gryan and built a bit of a chest? I have all the other top 9 -be players. I realise that Gryan played last night but you can of course go to a different rookie if you didn’t already do it. Basically what you would be doing is playing that breakeven game to get this warne-chest ready for other trades. If you have absolutely nothing else to do then yes this is a valid move to make. What happened at the Selection table? Well here are my thoughts on the fantasy relevant players. Zac Clarke comes in for the Bombers, this isn’t really relevant in Classic forms of the game but it is worth a look for your bench in Draft. Josh Kelly finally returns. Don’t touch him in the classic forms but if you took him in the first round in draft then this is the news you have been looking for. Shane Mumford is back which gives us another ruck option and this will help draft owners. Noah Balta is back so if you held you will be happy with that, otherwise don’t worry about him. Ollie Wines comes back into the side this week. We want to see what happens here in relation to the effect this has on Tom Rockliff, Travis Boak and importantly Willem Drew. Taylor Adams back is once again good news for Draft owners. Wait to see what he does before looking at him for Classic yet. Andrew Gaff’s return will be of great interest as we want to see if this will have any impact on the output of Dom Sheed. It didn’t in the JLT but let’s see what happens in the real stuff. Chad Wingard also returns and he is another that we want to see what impact he has on other players like Cousins and Worpel. But they will be aided by the exit of Shiels and Burgoyne. RDT and SC players start having moving prices this week. Get your rookies right this week now that we have seen two weeks we know pretty well which ones we need. Start watching the Break Evens (you often need to buy the stats packages of the various games to see these) and use them to assess your trades. If your league matchups hadn’t already started they will probably start this week. Best of luck for the rest of the round. Hopefully you got off to a great start last night and can continue that through the rest of the round. If you are attempting the loophole from last night just make sure you have your emergency set correctly and your captain is someone that is no chance to be a late in. Catch you all next round! No. Rozee is very pricey though. There is better value. I just did a Hore to Rozee trade and was looking to see if anyone else was jumping on it. This makes me more confident. Still cheap. Gives me a lot of cash. But I’m concerned might get role relegated with Windgard back in. Chase those points! Boak is off to a flier and if he keeps this up will be out priced soon. Wines back might influence his score. Whitfield is certain top 6 def premo. But this trade leaves my fwd line super weak with a crazy 4 rookies on field. 4. Keep Dunkley, do a sideways rookie trade like get Sweet if named, or Balta > Petrucelle. I am in this exact same issue. I hope someone else can give any opinions. I am more likely going for Whitfield because who knows when I can get him again, and I may be able to get Worpel in Next week even though the cash generation might be less from him, at least his output is still pretty good. Dunkley to Worpel is the perfect trade for this time of year. Make what you’ve lost back on the Worp! Plus leaves you around 100k of spending money elsewhere. If it was round 15 I would say Boak of course, you want the highest performing scorer, but its only round 3. Cripps and Hore out —- Whitfield and Wagner in. I have Elliott sitting in my fwd line but I feel he still has about 50k or so to make. Hore was the only real pressing concern this week. The million dollar question. Firstly I feel like hes pulling a 70 this week with the Horse/Hewitt tag. I feel that getting Whitfield in this week for him and still making around 40k off it is worth it. Plus with the Hore trade i’ll be fielding Libba/Walsh/Duursma/Constable as M5-M8 which im comfortable with. I also factoring in that right now I feel Macrae, Fyfe, MCrouch, Treloar, Neale and Sloane will all average more than Cripps and I don’t have any of them. So what are you people who’s team looks like this planning? I’m seriously considering just the ONE trade… (First time EVER)!!!! If Sweet is named for the dogs, may as well grab him as a pure luxury trade for a DNP ruck rookie. Thanks Shags for the very quick response, I’ve been reading your articles since you started great job mate! Yeah I’m thinking of the Captains loophole with Flynn as my on field ruck and Danger as VC (Fort being locked out now stuffs me a bit there, should have used him on field last night)…lol… But yeah…. if named do I risk it with Treloar as Captain and cash in on Sweet? Seriously good problem to have in round 3 nontheless. Powell or Parker for McCarthy? Is it worth going Chris Burgess up to Connor Rozee as a pure luxury trade? The only problem i have with it is that it leaves me $0 in the bank. S.Martin to A.Phillips or Mumford? Gives me $253k -$274k extra and then I’ve also $140k in the bank which then made me think about trading Petruccelle to Worpel?? S.Martin is probably the 3rd best ruck in the comp, sure he will mpre than likely loose cash this week but he will improve you would think. Pet has plenty upside and a wad of cash to be made yet so I wouldn’t be getting him out (rule of thumb wait until their BE gets close to their average then flick) only exception is if you have the cash to go premium. Probably need to see the rest of your side. Heeney to Worps or is that too reactionary? Longmire has dented my confidence far too much. Be of 46 v 120, I’d do it. plus 100K… I’m not convinced Heeney’s over the foot issues. As soon as Fantasy opened last Sunday night, I traded Heeney for Rowan Marshall. This netted me exactly $100,000 this allowed me to also bring in Cousins. Marshall very unique, playing as a ruck he should score similar or hopefully a little more than Heeney. He moves around the ground okay for a big guy, I’m hoping for 90 plus. An added bonus is come round six he will gain ruck status, this will be very handy.